Diabetes isn’t a simple condition, even if you don’t have to take insulin shots. It does, in fact, have the potential to affect almost every system in your body. This is especially true if it isn’t well managed. The main reason this is so is because it wreaks havoc on the circulatory system, which delivers blood to every cell in the body. When a person is diabetic, they have a much higher chance of developing clogged arteries. When blockages of the arteries of the heart or brain occur, heart attacks and strokes are possible. When this occurs in smaller arteries, it can reduce the circulation reaching your extremities, particularly the toes and feet. Deprived of proper circulation these tissues eventually die off, usually resulting in gangrene. It’s at this point when amputation becomes necessary. It’s very common for a diabetic patient’s veins to become damaged as well. This results in blood containing no oxygen (deoxygenated blood) collecting in the lower leg. It is this stagnant blood which causes the ulcers so common among diabetic patients. Sensory nerves of the feet are also damaged by poor circulation. This often results in a condition called diabetic neuropathy, which is the technical term for diabetes-related nerve damage. Diabetic neuropathy is known for two main symptoms. The first is tingling, numbness, and pain in one or both feet, which can be excruciating. The second is a loss of sensation. When a diabetic patient can’t feel their feet normally they’re much more likely to damage them. When this happens a simple blister or scratch can become a serious infection. As you can see, diabetes is a complex condition that goes far beyond high blood sugar. It can affect almost any area of the body, including the feet, organs such as the kidneys, and even the eyes. In addition, heart disease is much more common in diabetic patients. Leading a long, healthy life with diabetes is very possible, but it does take some effort. Proper management of this disease with diet, exercise, and medication is critical. How Much Should I Pay for Diabetic Socks? Cost shouldn’t be a consideration when buying diabetic socks, especially in light of their many benefits. In fact, consistently wearing high quality diabetic socks may be all that’s required to prevent some of the most common foot problems affecting diabetics. So, what should a good pair cost? Let’s use dress socks as a comparison. A lower end pair sells for about $4, while a higher end pair might cost you $15. 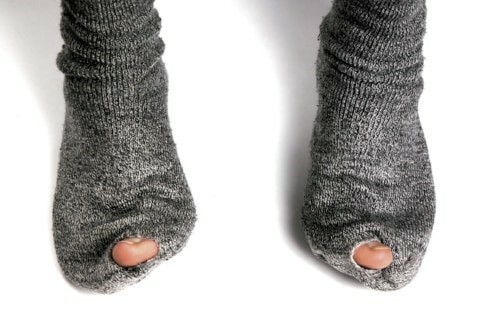 The average pair of diabetic socks is likely to run about $10. This is certainly more than most socks, but the extra money is well worth the aggravation you’re likely to save yourself. Which would you choose: saving a few dollars on socks, or avoiding possible ulcers and infection? If you’re a diabetic it’s a very good idea to wear diabetic socks regularly. Podiatrists deal with diabetic socks on a daily basis, and can answer any questions you might have. Out of all the healthcare professionals you see, podiatrists can best recommend a brand and style to suit your individual needs. What’s more, they may be able to offer you quality socks at a significant discount. All things considered, it’s a conversation worth having, and your feet will thank you.